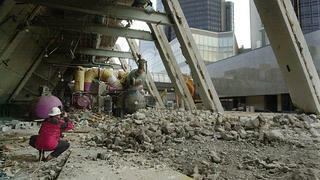 One of the street-killing concrete berms designed as part of Detroit's Renaissance Center was removed as part of SOM's redesign in 2002. This story originally appeared in CityLab. Find the original here. But these works have often been criticized by urbanists for turning their backs on the places they appeared in. Urban sociologist William Whyte called out two specific Portman projects in his 1980 film, The Social Life of Small Urban Spaces, saying of the Renaissance Center in Detroit that it presented itself as a place to “come in and be safe from Detroit.” L.A.’s Bonaventure Center, Whyte added, was scaled to the freeway, not pedestrians.